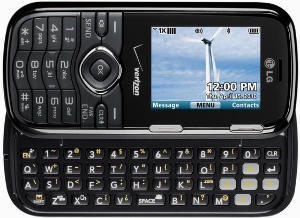 The LG Cosmos is a phone that comes in the candy bar form and it offers a full QWERTY keyboard which slides out, a very nice thing to have if you’re looking for a cheap phone that allows for messaging with ease. LG Cosmos VN250 is a music phone which offers a clear sound with a powerful bass and it combines its music qualities with access to social networks and quick use of the messaging functions, thanks to the QWERTY keyboard. Ringtones, games and other apps can be downloaded from Verizon and the phone’s capacity can be expanded by 16GB with the help of a microSD card. The LG Cosmos VN250 also comes with Bluetooth, Bing search, settings for voice clarity, personal organizer and the battery lasts up to 6 hours of talk time. You can use the VZ Navigator service, allowing for GPS navigation capabilities on the phone. The screen of the phone is a 2 inch LCD with a resolution of 240×320 and you can access the Internet on it as well. You can take photos with the help of the 1.3MP camera and upload them to social networks.